I've decided to install them in the door bottoms, not in the side mirrors. 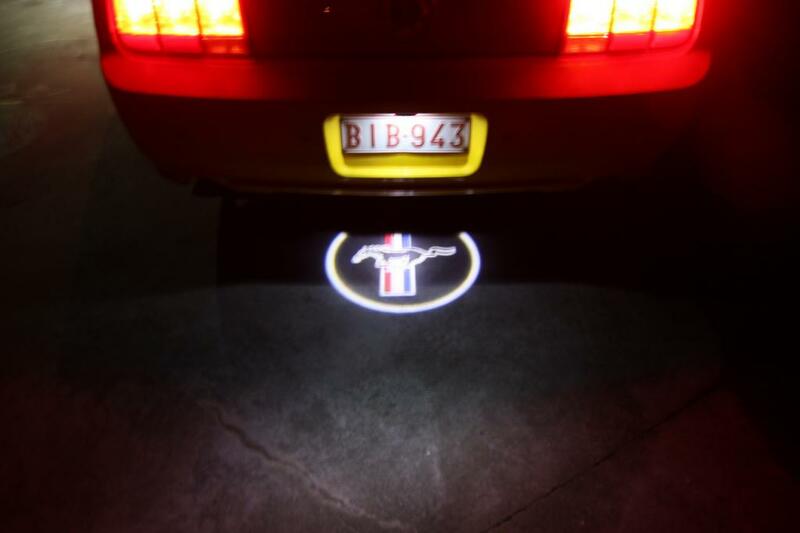 I hooked the lights up temporarily to a battery charger and held them next to the mirrors and the circle of light is very weak and covers a wide area, also I think the door itself would interfere with the lights and cut off part of the logo. 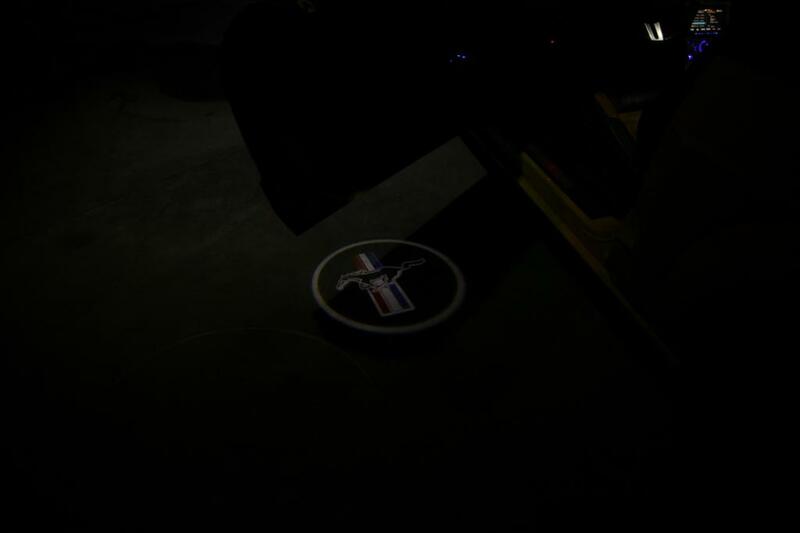 When I held them at the door bottom height, the light was very bright, the logo sharp and distinct, even with the lights on in the garage. So far I've gotten one of the door panels off and now have a choice to make. Do I drill into the metal bottom of the door or into the plastic inner panel to mount the lights. Originally I thought I would drill into the plastic inner panel but once I got it off I discovered that the area where I would mount the lights is sealed off with an inner plastic panel (I think this is to enhance the sub-woofer sound and to keep moisture away from that speaker). If I drill into this cavity I would also have to cut an access hole to mount the lights, then try to seal that hole with some kind of waterproof tape or similar. So, I am thinking that I will drill into the metal bottom of the door. I can use some liquid sealer around the hole after I install the lights to help with moisture. Also, if I mount them here, if I ever have to replace/adjust them later, it would be much easier to access this area. Well, after spending the better part of a day trying to find a way to bring the power from the door into the cabin I gave up. I tried and tried to run wire through the door's corrogated rubber tube with the rest of the wires from the door but it just wasn't possible for me. So, I decided to install the logo lights one centered in the front of the Mustang (from under the spoiler) and one centered in the back bumper area. I still have to tie them in with the cabin dome lights (like powered sill plates). I did test them with my battery charger after getting them placed and I'm very pleased. I will post pictures once I'm done totally. I just installed those projectors in my door and it looks good i think. Installed them about a month ago using the power from the doorswitch lights but then they were only burning when the ignition was on. Today i powered them from dorm lights in the A-style. Had some issues because i first took mass from the door itself but then they stayed on all the time so that would just drain my battery. Then i also used the mass from in the A-style and now it works just fine! There is no other option i think than drilling in the metal (like done in the manual from sdmustangs like slickman posted. Wished I had that one when i installed mine, would have saved me some searching, testing and measuring). Also installed one in the back between the exhaust (and waiting on a backorder for one in the front). Added an extra button for that in the dash because it's illegal here to use that on the streets. Those are really bright and have great definition. The ones that came stock on my car are pretty cool but they arent quite that bright. Looks good man. I can't post any pics since I don't have any pics at a host, only on my hard drive but they look just like Phillip mustang2. I have one centered in front and one in back. I am having an unrelated problem and wonder if anyone else is. Since I installed these lights my key fob is not responding like normal. I can't unlock my passenger door with the fob and when the lights are on after hitting unlock, nothing else works on the fob (like the trunk unlock). Once the lights go off I then can unlock the trunk, etc. Anyway, anyone else with similar problems? You need to rewire the lights. They ground out the system when they are on. You need to go to the other wire. Wish I could give you mine. Kids like them and I hear they're a real hit down at the trailer park. Only good thing will be when aftermarket places allow me to replace the pony with the bat signal or maybe one of those mudflap girls. Did you follow wiring instruction as per the ones I posted?